Chrononaut Mercantile – tagged "wool"
We are always delighted when we get to see our cloaks out in the world. It makes all the hard work completely worthwhile. 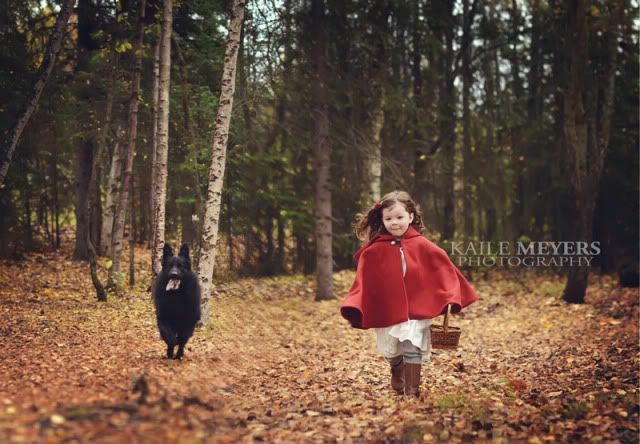 We'd like to shout out to two customers who made our red cloaks come to life with some Red Riding Hood fairy tale magic. Theresa & Erin Timony show off one of our Half-Circle Cloaks in this wonderful makeup tutorial. Kaile Meyers Photography did a fantastic collection of shots of one of our kids capes. We love seeing how you make our work into part of your own story. Send us a picture or video! Our hooded wool cloaks are handmade in our studio in Maine. Each cloak is hand sewn with a blend of nylon and the very best quality wool to make sure that you can wear your cloak out into every kind of weather and still stay warm. The natural properties of wool make sure that your cloak will be working to keep you warm even when it gets wet. We cut the hood of the cloak large enough that you can pull it out when the snow is falling to protect your face, or even fit a hat under the hood! We use garment quality leather to create the cloak clasp. Rather than using a metal clasp which can fatigue over time, we fold and stitch a durable loop of leather and loop it around one of our hand cast pewter buttons made by Lars Lunde of Lundegaard Productions. We've been making and selling cloaks since 2008, and we have never had a leather loop fail. Living in Maine, we have a lot of opportunities to test out our hooded cloaks in snow, ice, rain or a mixture of all three. Although we mostly sell our handmade cloaks at Renaissance Faires, our customers include larpers and outdoorsmen and women who really give the durability of our designs a workout. Like a winter coat, one of our wool cloaks is considered outerwear, and should be dry cleaned seasonally or more often if needed. You can also brush twigs, leaves and dirt off the surface of the wool, or spot clean with Woolite as needed.